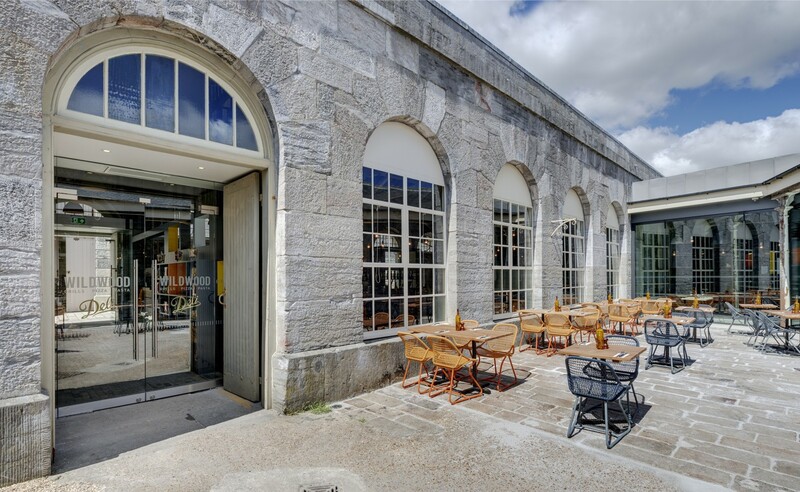 The Grade I Listed Slaughterhouse building sits just inside the main entrance to the Royal William Yard in Plymouth, arguably one of the most significant groups of historic military buildings in England, and a remarkably complete early 19th century industrial complex. The buildings are being carefully restored and brought back to life as places to live, work, eat and drink. With its single storey volume and long linear plan Slaughterhouse is unique within the yard. 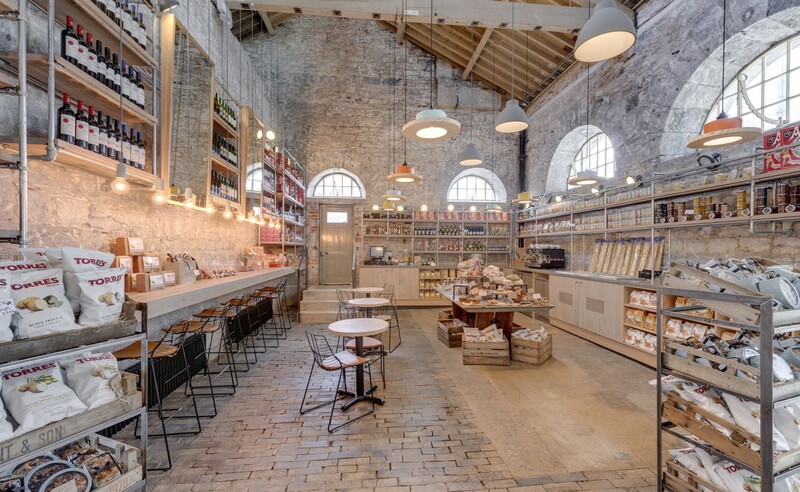 The existing interior is comprised of the historic fabric, with rubble stonewalls, original timber trusses, old painted surfaces and worn patched floor finishes. 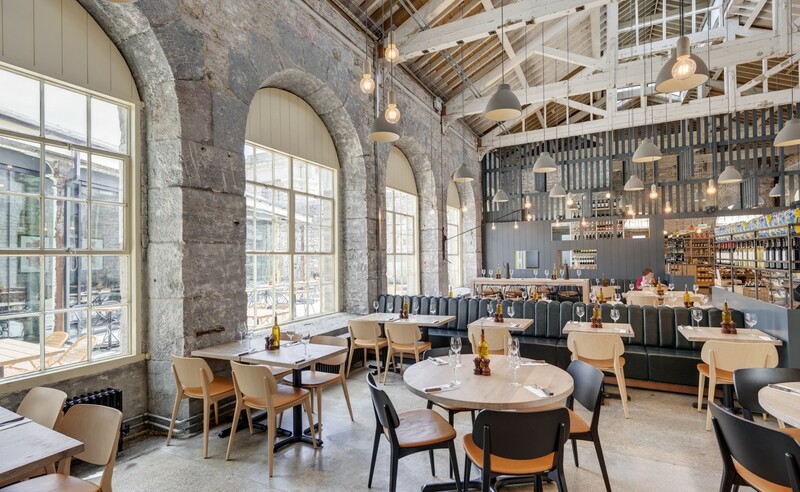 Historic elements of note include the timber ledge and braced doors, woodblock floor and the high level lantern roof light providing an abundance of natural light. A key aspect of the brief was to make a light, minimal impact on the building and to enhance the inherent material and spatial qualities of the spaces. 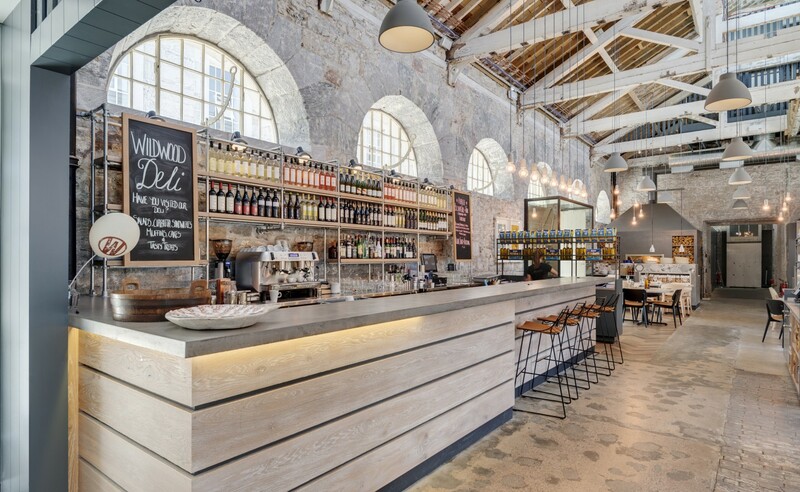 This was whilst maximising the usable footprint for the proposed Wildwood restaurant, deli and bar. 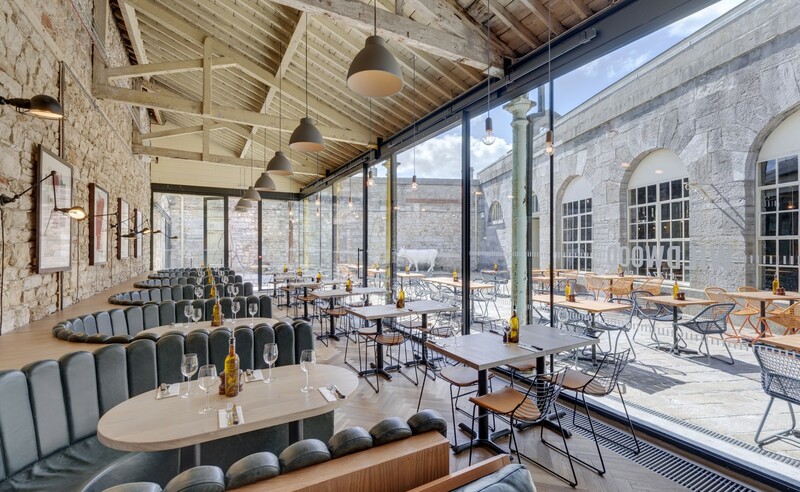 The interior has been enhanced through the installation of glazing set behind the existing column line in the cattle lairs. 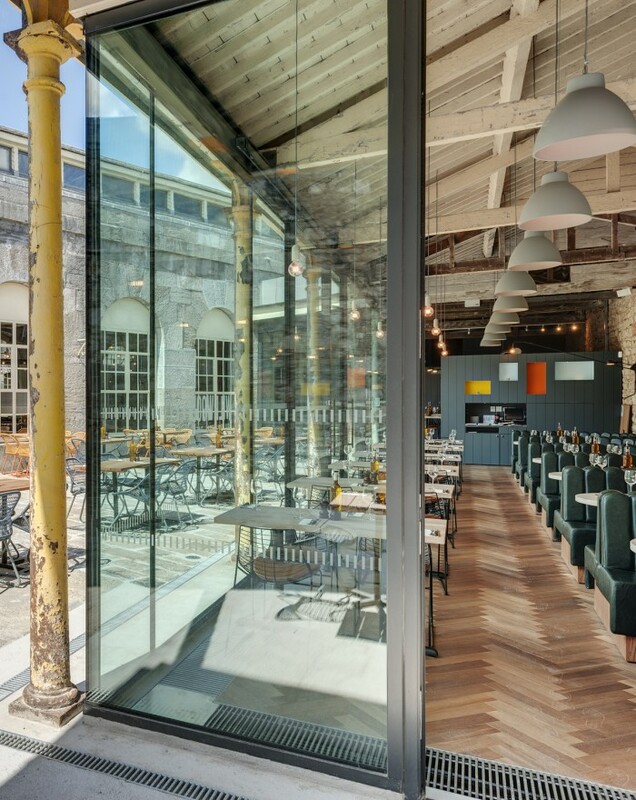 The simplicity and geometry of the frameless glazing enriches the composition of the courtyard whilst strengthening physical and visual connections throughout. Modern insertions are self contained and kept to a minimum. The soft muted tones of the new palette both contrast and complement the raw finishes and textures of the existing building. 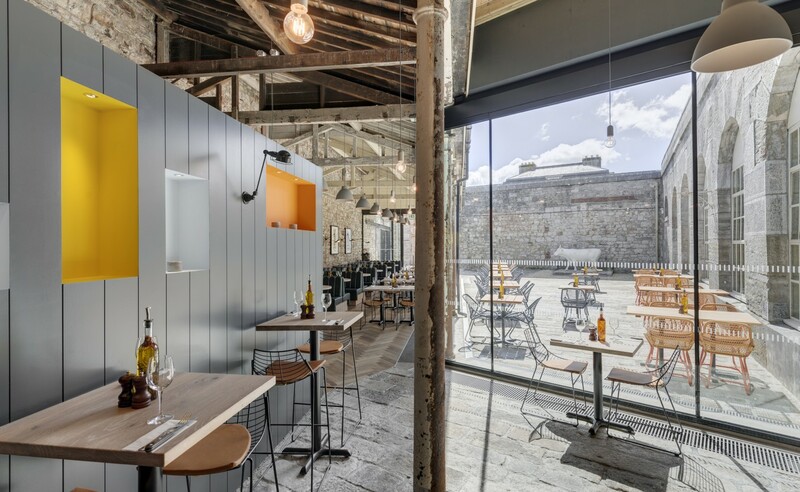 Upholstery and warming timber finishes take the edge off the hard surfaces of the building fabric; colour is used moderately adding vibrancy whilst remaining sensitive to the existing character.